Apart from a lot of mess and many mistakes? After making stuff for Emily’s school fair, I rather ran out of steam and the run up to Christmas is exhausting. 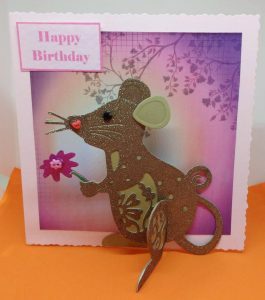 I can’t even remember what cards I made for Rob and Emily. I have just had to look at a picture of the mantelpiece from Christmas to remind myself! 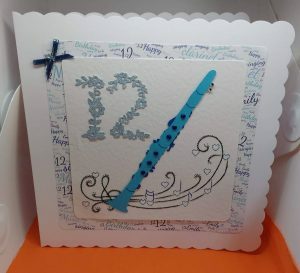 I didn’t make one for Rob as I saw one that someone else had made that appealed to me and I didn’t photograph the one I made for Emily, I seem to remember it was a last minute rush and I thought I would photograph it after giving it to her, but never did. I do have the cards somewhere, in that safe place where you put things and then can never find them again! What with Christmas and my blog changing and me not being able to work out how to use it, I haven’t posted for a while. Christmas is now a distant and fuzzy memory, not due to alcohol as I can’t drink, but due to doing too much and making myself very ill. But I survived, somehow. My daughters birthday is exactly 6 weeks after Christmas, so once I feel a bit stronger I have to get ready for that. Her birthday was yesterday and she is now 12. I can’t believe it, where do the years go to? So assuming that I have got it right after many failed attempts, I should be able to add photos of what I have made since my last post, fingers crossed! 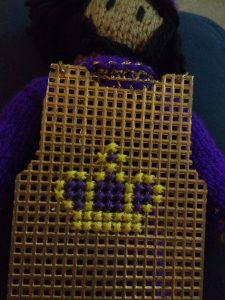 I stitched this crown on for a friend who makes the knitted characters for bible stories for her church. this is King Saul. Yay I seem to have got the links to work too. 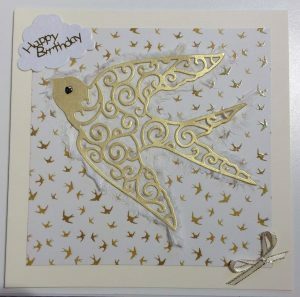 Made with Docrafts Cuckoo Die. 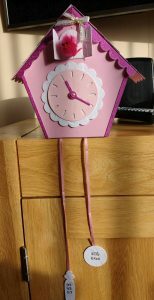 The Cuckoo die is meant to create a hanging wall clock. 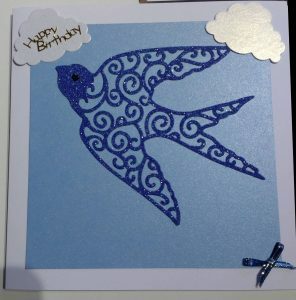 The bird that is part of it is so fiddly to make and attach I got the little fluffy birds instead. 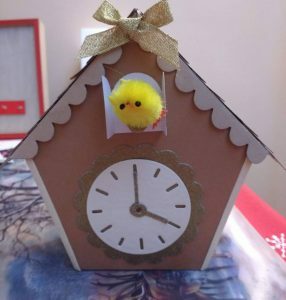 I have no idea why I chose 4 o’clock. There are also dies for the weights which go underneath, but I didn’t use them for this one. It took a while to work out how to put it all together as there weren’t any instructions with it! We found a you tube video of someone making it as a pen pot. 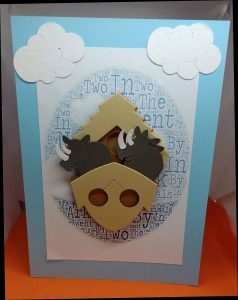 It is quite fiddly to put it all together and the base card needs to be thicker to make it more sturdy I think. I made the one above and a Christmassy one which I forgot to photograph and then made the one below for my Daughters birthday. With date of birth and weight and time. 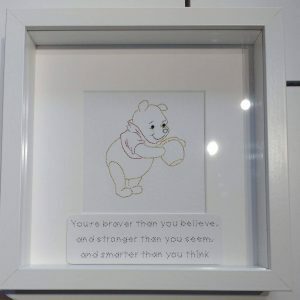 Like the idea of making these for new baby gifts. 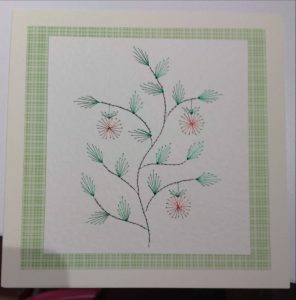 Made for a friend of my Mum. 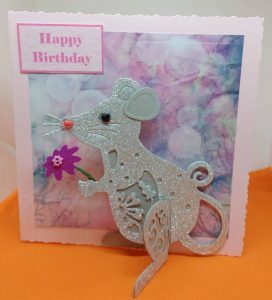 Creative Expressions 3d Mouse Die. 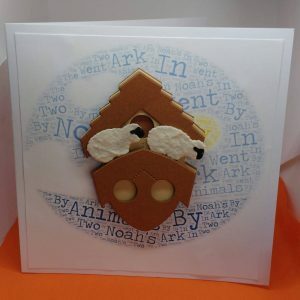 The Noah’s ark cards are for sale, but not yet listed in my shop so email if you are interested in them. I have only used part of the die set, there is another part that attaches to the front to make a free standing cat. I can’t remember the make of the backing paper. 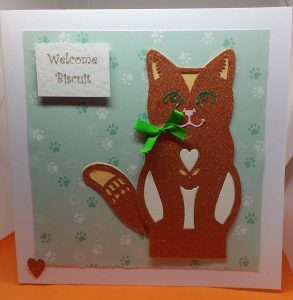 The colours are similar to the cat, but he isn’t sparkly! I can’t leave without a mention for the biggest and most important thing I ever made. Emily who reached the grand old age of 12 this week! 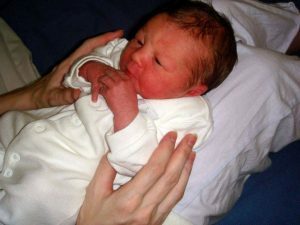 Emily at 1 day old. 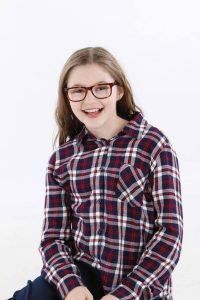 Emily as she is now! Well there it is. It’s a long time since I wrote a long blog post, it is hard work. Now to publish and see if it works, I am not going to be a happy bunny if it doesn’t!